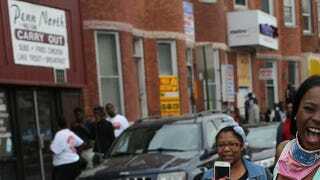 Baltimore residents celebrate at the intersection of West North and Pennsylvania avenues May 1, 2015, after the Baltimore state’s attorney announced charges brought against six police officers in the death of Freddie Gray. She said, “Accountability, you’re getting it today,” and the celebration followed. That was the reaction after Baltimore City State’s Attorney Marilyn J. Mosby said those words Friday morning during a press conference announcing that six officers would be arrested and charged in the suspicious death of Freddie Gray. Mosby, who spoke to the crowd of reporters with authority, wound up sending Baltimore into a celebratory frenzy. At Pennsylvania and North avenues, blaring horns, hugs between strangers, impromptu songs and even a few coordinated dances reflected the mood, a rapid change from the riots, fires and frustration that lined the same block just a few days before. Many spoke of feeling empowered to fight other problems plaguing the community. Gray, Mosby said, received his fatal injuries from not being properly secured in a police wagon. Officers, who had no legal basis for arresting him, according to her report, also failed to seek medical attention despite his repeated requests. The six officers—Officer Caesar R. Goodson Jr., Officer William G. Porter, Lt. Brian W. Rice, Officer Edward M. Nero, Officer Garrett E. Miller and Sgt. Alicia D. White—were slapped with a variety of charges, including manslaughter and false imprisonment. The most serious, “second-degree depraved-heart murder,” for Goodson, the driver of the van, could carry a sentence of 30 years. Mosby’s husband, Nick Mosby, a first-term City Council member who represents the district where Gray died, joined in the celebration as revelers thanked him and his wife and gave him hugs and pounds. Nick Mosby became an Internet celebrity earlier this week when he shut down a Fox News reporter who didn’t want to listen to the root causes of the riots.